Did you mulch your garden or field with grass/pasture clippings or wood chips? Or did you use animal manure? That may explain why your vegetables are looking funky. Some of these cases are consistent with typical symptoms of a chemical injury, specifically growth or hormonal disruption, caused by certain herbicides. Table 1. Injury symptoms related to different chemical classes of herbicide. Herbicide injury symptoms can range from defined spots, blotches and change of color to severe tissue distortion or plant death. Unfortunately, some of these symptoms are also caused by pathogens (virus, bacteria, and fungi) and can be easily confused with diseases. The ISU Plant and Insect Diagnostic Clinic can help identify damage caused by diseases, insects and some abiotic conditions. We DO NOT test for pesticide or chemical residue, but we can provide a list of laboratories within the United States that will. How can plants be exposed to herbicide? Plants are exposed to pesticide through least three different ways: 1) residues remaining in the soil, 2) spray drift and/or 3) improper use of a product. Drift and improper application can be easily prevented by reading the herbicide label in detail and using the product as directed by the manufacturer. Herbicide labels have warnings and rotational restrictions that must be followed. Drift can be avoided by watching wind speed and direction during application and using appropriate spray equipment. Many products have restrictions regarding maximum wind speeds during application. Preventing herbicide carryover can be trickier. Some herbicides can persist in the environment at phytotoxic concentrations for relatively long periods of time. 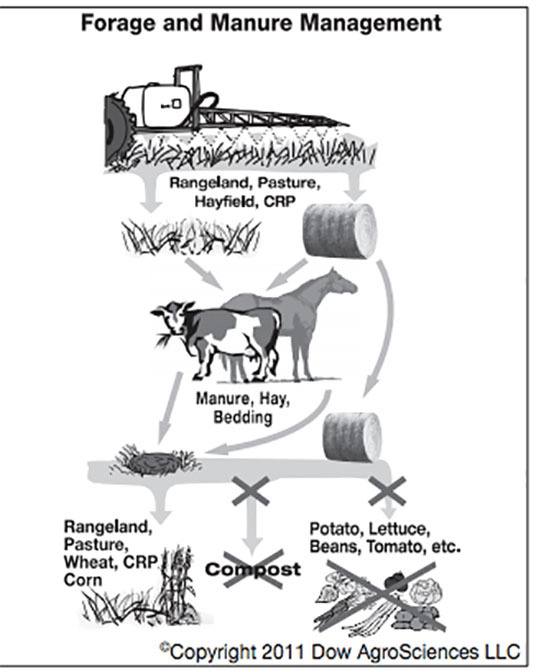 Grass and pasture clippings could be contaminated with herbicide if the lawn or pasture were treated. Likewise, trees that have been treated with chemicals and chipped into woodchips can contain herbicide. Animal manure can be contaminated with herbicide as well. It is also important to note that manure may also pose health safety risks if it is not composted properly or applied at improper times. Even though compost is a great way to improve soil health, herbicide contaminated grass clipping or wood chips added to compost can perpetuate the problem. To prevent herbicide injury on your vegetables, make sure only to use untreated grass clipping and untreated woodchips as mulch. If you decide to use compost beware of the risk it may pose to the health of your plants. Tomato (left) and potato (right) showing what we suspect as growth regulator herbicide injury or exposure. A common warning on herbicides labeled for pasture use. Hay from treated fields should not be incorporated in compost or used as mulch when growing vegetables. Photo credit: Dow AgroSciences; forage herbicide label. Links to this article are strongly encouraged, and this article may be republished without further permission if published as written and if credit is given to the author, Horticulture and Home Pest News, and Iowa State University Extension and Outreach. If this article is to be used in any other manner, permission from the author is required. This article was originally published on June 26, 2015. The information contained within may not be the most current and accurate depending on when it is accessed.